Teacher Christa McAuliffe experiences the "vomit comet." 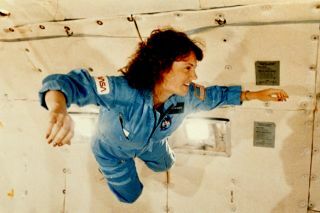 In this historical photo from the U.S. space agency, Sharon Christa McAuliffe received a preview of microgravity during a special flight aboard NASA's KC-135 "zero gravity" aircraft. A special parabolic pattern flown by the aircraft provides shore periods of weightlessness. These flights are often nicknamed the "vomit comet" because of the nausea that is often induced. McAuliffe represented the Teacher in Space Project aboard the STS 51-L/Challenger when it exploded during take-off on January 28, 1986 and claimed the lives of the crewmembers.